From ancient sites to modern cities, the movement of the sun has inspired and intrigued architects for centuries. From tracking the sun’s movements to revealing hidden design features, there can be a lot more to a structure than first meets the eye. We bring you 10 examples of landmarks that change with the annual path of the sun. How many have you heard of? A British cultural icon, this ancient masterpiece of engineering has long baffled historians and geologists. Comprised of large standing stones, several weighing around 25 tons, different theories have emerged as to how it was possible to transport such a heavy load and assemble the structure at a time before technology or mechanization. The precise purpose of the stones is also disputed. However, its alignment with the sunset of the winter solstice and the sunrise of the summer solstice is clearly significant. Thousands of visitors flock to the famous rocks every year — particularly on key days in the solar calendar. This famous pyramid in Mexico is located in the center of an ancient Mayan site. Twice a year, the structure comes to life. On the spring and autumn equinoxes, sunlight hits the pyramid in such a way that a shadow in the form of a moving snake appears along its 91 steps. The huge snakeheads carved at the bottom of the steps further enhance the effect. Known as the descent of the great feathered serpent, it symbolizes one of the most important gods for the Mayans. This must-see sight in the heart of Rome has a unique lighting set-up. Its famous hemispherical dome roof has a 9m-wide circular hole in the middle, known as the oculus, which introduces sunlight (and rain) to the space below. Curiosity surrounding this unusual design has led to many different theories, and in 2011, a new one emerged. It was suggested the hole may have acted as a giant sundial. 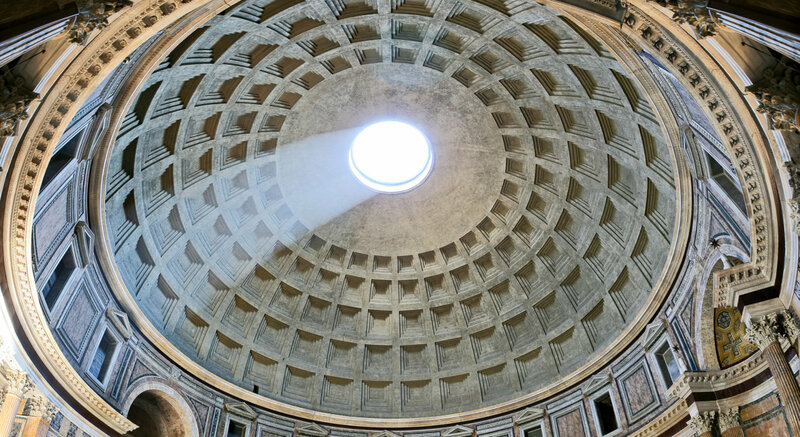 Historians also found that when sunlight enters the Pantheon on April 21 — the traditional anniversary of Rome’s founding — it is re-directed to the entrance of the monument. As this would likely be the day an emperor would visit, this is unlikely to be a coincidence. One of the new seven wonders of the world, this ancient site is carved out of sheer red rock faces in Jordan. An impressive place at any time of the year, on certain dates, visitors might get a more dramatic view of the giant metropolis of tombs, monuments and other religious structures. The jury is still out on whether or not it was done deliberately, but at particular times of year, key areas of the site are highlighted by the sun. While modern day researchers use statistics and technology to confirm the sun’s orientation with the monuments, those that built it would have relied on observation alone. Easter Island in the Pacific Ocean is one of the most remote places on Earth. With a population of only 6,000, it receives over 80,000 visitors annually. One of the main attractions are the many collections of stone human figures (moai) found on the small landmass. Of these, the Ahu Akivi is seen as a particularly sacred place. The site is home to seven identical moai statues that face the sunset during the spring equinox and have their backs to the sunrise during the autumn equinox. It is the most astronomically precise feature on the island. 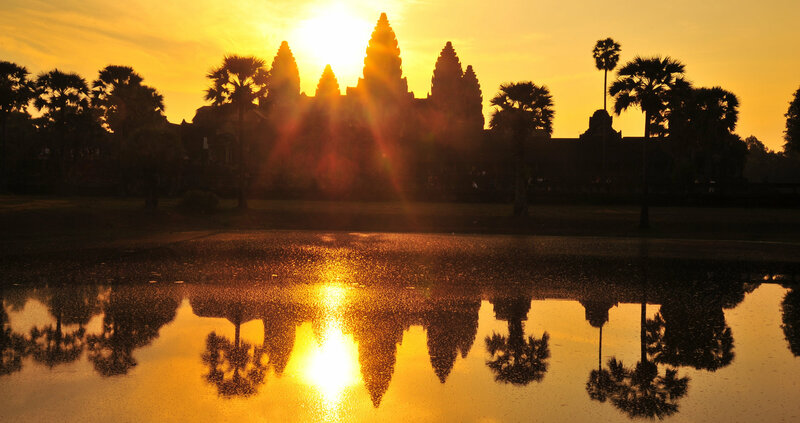 Think Cambodia, think Angkor Wat. The largest religious building in the world, this awe-inspiring temple forms part of an ancient city. During the 12th and 13th century, Angkor was the capital of an empire that stretched from Malaysia to Myanmar. The temple itself imitates Mount Meru, the holy mountain considered to be the center of the universe – the main tower representing the summit. It is above this tower that the rising sun of the equinoxes appears, providing the temple with a luminous crown. Investigated in depth by researchers from the University of Michigan in 1976, they suggested such orientation would have been significant as earlier Cambodian calendars were based on lunar and solar cycles. One of five unique astronomical observatories built by Maharajah Jai Singh II between 1724 and 1730, the site in Jaipur is both the largest and the best preserved of the set. The UNESCO World Heritage Site contains different geometric devices for measuring time, predicting eclipses, tracking stars and much more. It is also home to the world’s largest stone sundial. In fact, every device is large. They are designed to be permanent structures rather than smaller traditional devices. While some believe the sites were built in different places across the country to enable comparisons to be made, others suggest they had a political significance. Carved into a rock face on the banks of the River Nile, the Abu Simbel is one of the most photographed sites in Egypt. Built by King Ramses II, the site contains two temples, the larger of which is comprised of four 21m-high statues of Ramses himself. In the middle of the sculpted giants, there is a small door leading into the temple. Although it may seem insignificant compared to its surroundings, twice a year the door directs sunbeams directly onto statues of King Ramses II and Amun (the god of light) located inside the inner sanctum of the Abu Simbel. And not just any two days: it has been suggested that the first date it occurs is Ramses’ birthday and the second his coronation day. Older than both Stonehenge and the Egyptian pyramids, this mound-like monument may not look like much at first. However, once a year during the winter solstice its magic is revealed. As the sun rises, sunlight floods the inner chamber of the monument after passing through a 19m-long passage. This ancient site demonstrates how an interest in the sun (and light) has been part of cultures for thousands of years. Something to bear in mind: If you want to witness this phenomenon, you have to be quick — the light disappears again after just 17 minutes. Twice a year, close to the winter and summer solstice, the sun sets exactly between the east-west streets in the Manhattan grid. The result? A perfectly framed sun sandwiched between high-rise buildings. Also known as the Manhattan Solstice, the term “Manhattanhenge” was coined by an astrophysicist from the American Museum of Natural History in reference to the first location on our list. He suggested that if ancient ruins of Manhattan were to be dug up in the future, it would be fair to assume some form of astrological significance. Furthermore, with the event taking place on Memorial Day and Baseball’s All Star break, it could be assumed that these were the two things being worshipped! Elsewhere in North America, similar phenomena can be witnessed in cities such as Montreal, Chicago and Toronto.